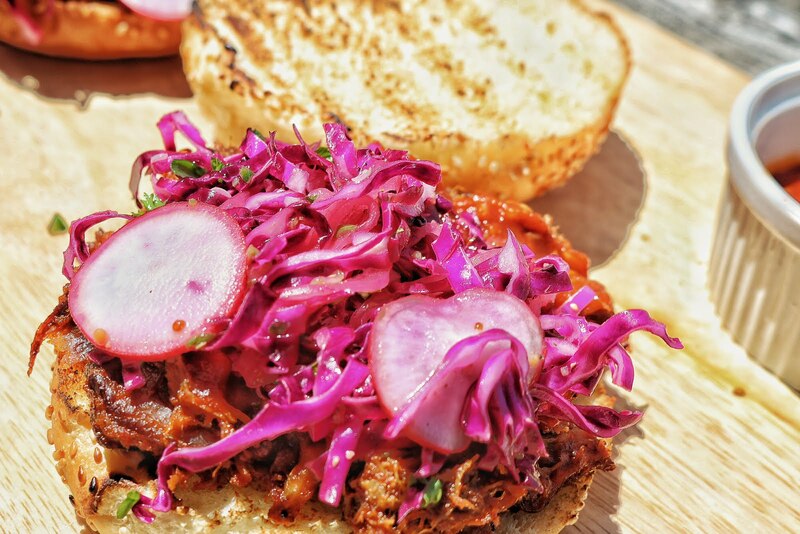 If you haven’t yet seen my post on pulled pork tacos yet, I recommend you check it out here first before diving into this article. 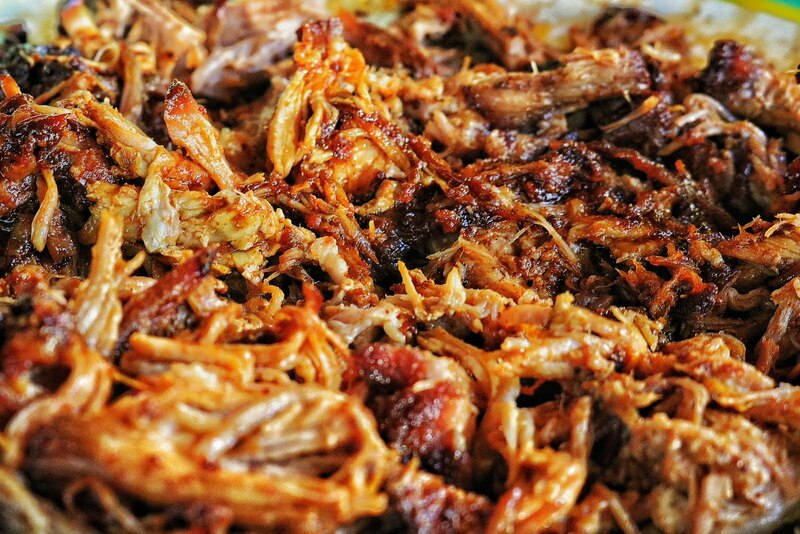 Today is about how to use up leftover pulled pork to make some saucy, delicious, messy pulled pork sandwiches. I recommend making the sandwiches for leftovers because on the day of cooking, the pork is just so damn flavourful and juicy. I am a pork purist, and believe that day-of pork stands on its own and doesn’t need to be smothered in sauce that can sometimes hide all the work you did to make it so juicy in the first place! A few days later, however, the pork may have dried out just a tad, and can be completely brought back to life with a sauce that compliments the flavour of the pork and adds that extra bit of juiciness that’s been lost over the days in the fridge. 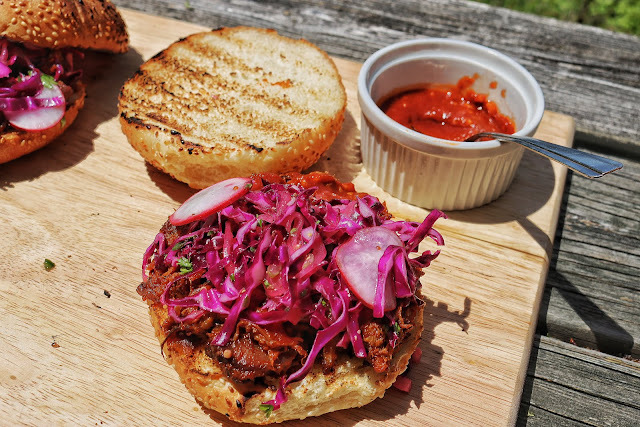 I’m serving up pulled pork sandwiches in a sweet and tangy barbeque sauce topped with a vinegar-based red cabbage, jalapeño and radish slaw. The sweet and smoky sauce pairs so perfectly with the salty pork, and the recipe actually belongs to a close friend. He worked on perfecting this sauce for days and has a bit of a love affair with BBQ sauce, so trust me, it’s delicious. The spicy slaw serves as the necessary acidic relief from all that richness, and also adds crunchy texture to an otherwise mushy, delicious mess. This sandwich is salty, smoky, sweet, spicy, tangy, and just downright delicious. Get some beers in the fridge, stock up your napkin supply, and get cooking! Night before eating, prepare the rub by combining paprika, mustard powder, salt, garlic powder, brown sugar, cayenne pepper and black pepper in bowl. Divide in half, and set one half aside for tomorrow. Pat dry pork shoulder with paper towel and poke holes all over using skewer or fork. These holes will help the brine seep into the meat better. Submerge pork in brine and cover with plastic wrap. Leave in fridge for at least 12 hours, up to 24 hours. Remove pork from brine and pat dry with paper towel. Cover pork completely with rub and put back in fridge for one hour (if time allows), or place directly into the pot with the fat side up. Pour in chicken stock about 1 1/2 inches up side of pot (do not pour over pork, rub will come off). Add quartered onion and smashed garlic cloves into chicken stock. Cover and place in oven at 275°F (or on the grill on very low) for 6 hours, or longer if pork is not very fork tender. Check on pork every 1.5 hours, adding about 1/2 cup chicken stock to the bottom of the pot each time. Start basting pork with surrounding cooking liquid after 3 hours, but not before (because the rub will come off). 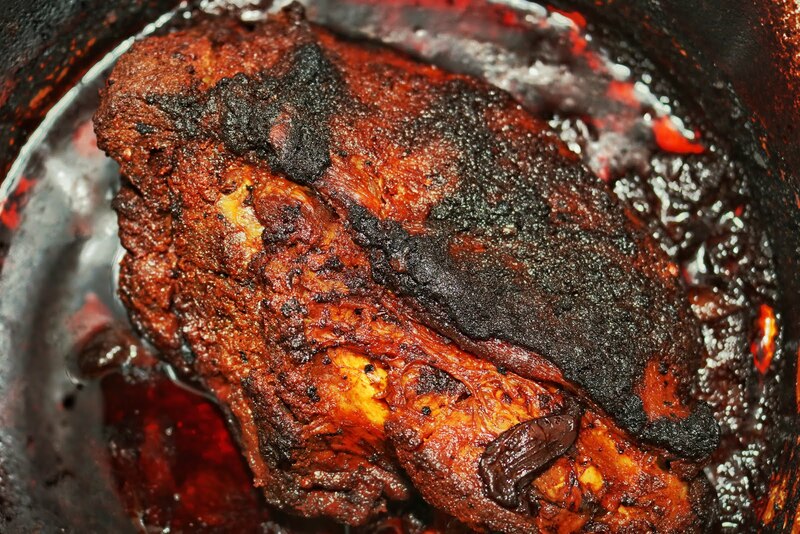 Pork and surrounding liquid will start to look burnt about 3 hours in. This is OK and the burnt bits are actually packed with delicious deep flavour.  If you feel the top of your pork is looking too burnt, place a piece of aluminium foil directly over the top of the pork, but still keep pot covered with lid as well. About 20 minutes before removing pork from oven, remove lid and aluminium foil if applicable. Baste the pork with cooking liquid, and leave uncovered in oven for 20 minutes. This will help form a slight crust on top of pork. Remove pork after 20 minutes and set aside to rest for 10 more minutes. Remove the pork from the pot, and place in a shallow dish. Scoop out all brown bits from bottom of pot (onion and garlic) and place on pork. Using two forks, pull the pork apart and incorporate brown cooking bits. Add 2 tablespoons of brown cooking liquid from pot and incorporate. This is a perfect time to sample the pork on its own. Prepare to have your mind blown. Pour the sauce overtop, stir, and enjoy! In small pot, combine all ingredients for BBQ sauce. Place on stove over medium heat and bring to a simmer. Cook until sauce is thick and coats a spoon, about 20 minutes. Slice buns and heat on grill if desired. 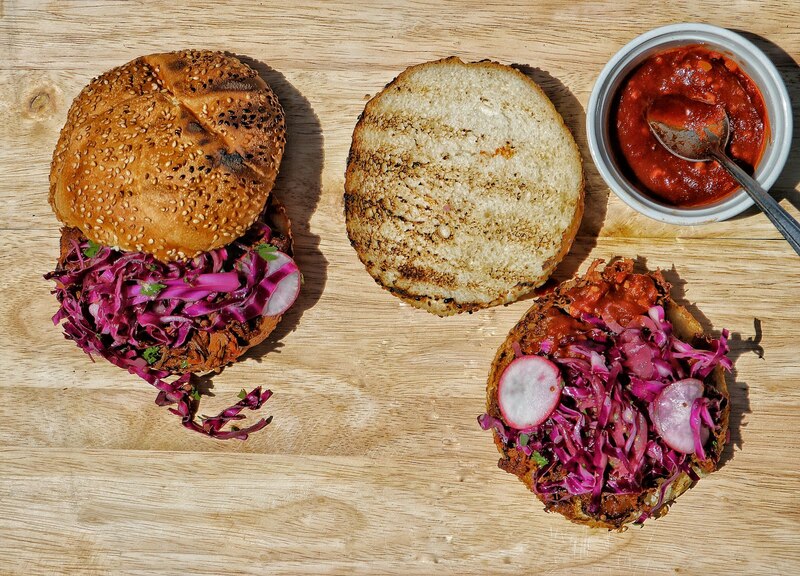 Top buns with a healthy portion of pork and slaw, and dig in! *Always taste jalapeño peppers before putting them into something. Jalapeño are delicious peppers, but they vary greatly in heat. Some taste like green peppers, others can blow your top off. Be sure to test the heat level and add the appropriate amount to your slaw accordingly. You can always add more, but you can’t take it away once it’s in!